I finished this one up when it was cooler a few days ago. I don't have a pattern for this because it is simply just too easy. I sewed crumbs/pieces to adding machine paper tape, then when I cut the white strips, I started out with my white pieces thinner, then increased the width 1" each piece as I went away from the center. I made both sides even. I cut my pieces of paper tape 96" long. I did the same with the white fabric - but notice - it isn't all the same shade/color. I was using upcycled fabric, so I had to use several different pieces to have enough. I didn't notice the difference in shades/color until I took the picture outside where the light made it more obvious! 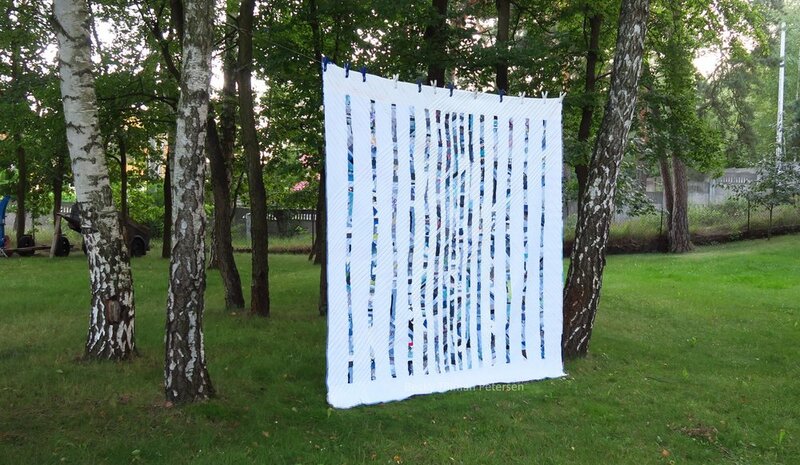 Since it is an upcycled quilt and apparently the modern quilt guild decided that it's okay to mix off white and white, I'm quite relieved! Starring Monkey Wrenches I had no idea that the whites and off whites were so different until I took it outside and took pictures! I wouldn't have known that fact except that someone told me when I saw that my Starring Monkey Wrenches had such variations in the white which I also didn't see until I took the pictures outside. Obviously our LED/fluorescent bulbs aren't giving me good light through the winter. 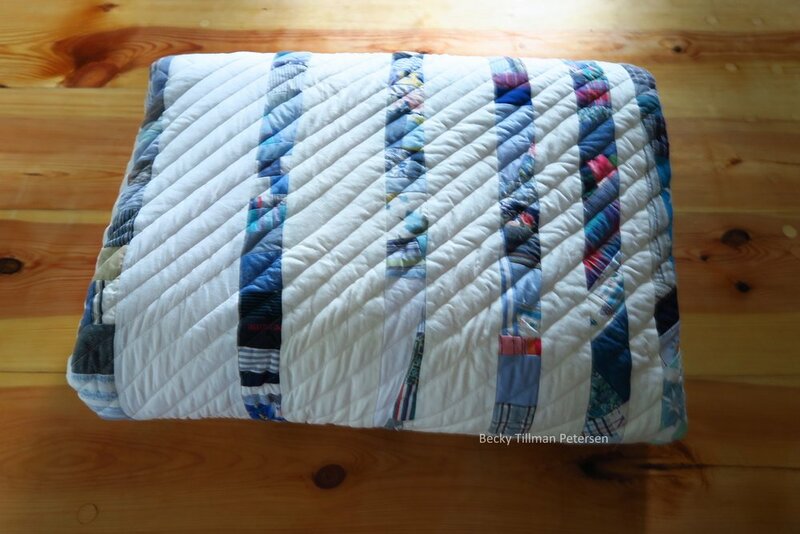 I quilted it with straight line quilting in one direction. No cross hatching on this. 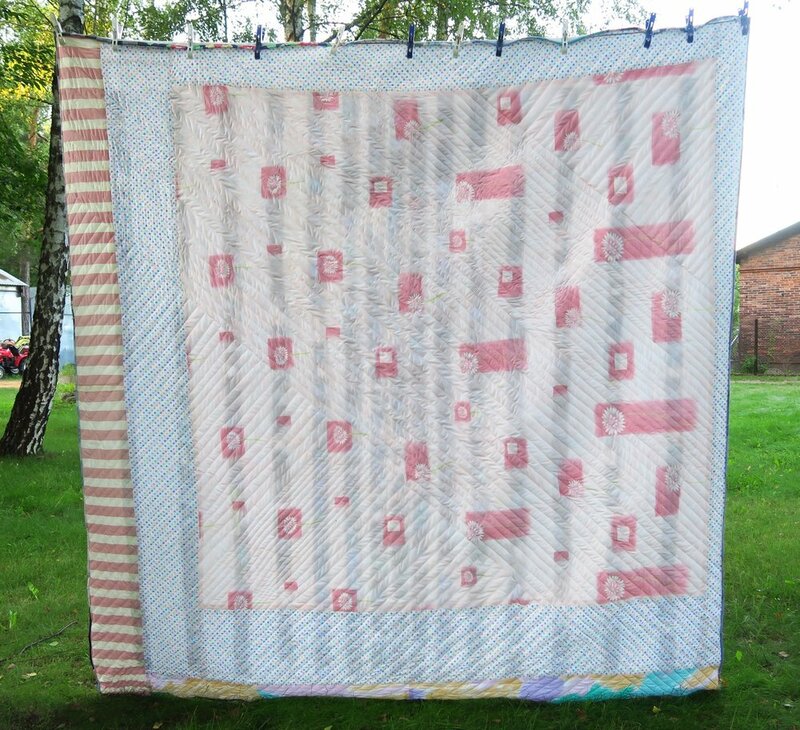 There are no pink spots on this quilt - if you see a bit of pink, it is show through from the backing as I had it outside on the line taking pictures. I drew on this with a royal blue Crayola washable thin line marker. It washed out perfectly fine. I decided to quilt it in an asymmetrical design to make it more interesting. I drew on the top with a Crayola washable blue marker so I could try to get straight - and with something this big, I had to have an idea of where I was going to go if I were going to succeed even slightly! It's done and it is almost as good as I had hoped it would be. The back of the quilt. All upcycled fabrics. I pieced this top. It's crazy! I figured it really didn't matter - as that was pretty much the theme of this quilt! Plus, it's interesting - or at least more interesting with this kind of quilting than just plain up and down quilting! I give myself leeway with this kind of quilt anyway. It's a crumb quilt - there is nothing "regular" about it - so I figure the quilting can be that way as well! With the light coming from the back, you can see the quilting quite well. This particular quilt falls in both the "upcycled blues project" and the "crumbs/strings project", so I've updated the pictures on both of these pages. I did not write up an official pattern - I just don't think it is necessary. You can make one similar to this just by reading what I did and adjusting for what sizes you like and have. And that's what's been up with my quilting lately! Have a great day wherever you are reading this!